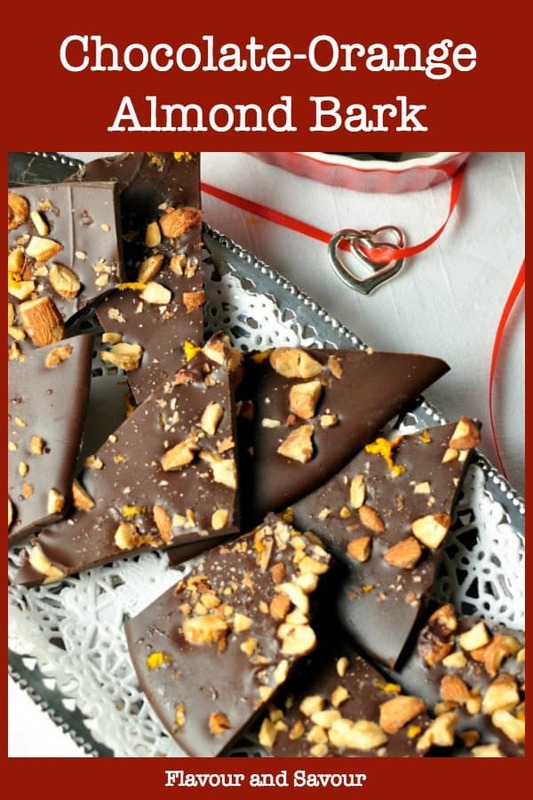 This Salted Dark Chocolate-Orange Almond Bark could be the perfect ending to your romantic date night dinner. 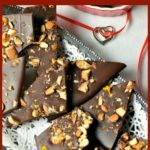 Only 4 ingredients needed for this chocolate bark! 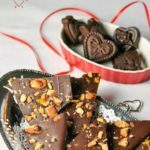 Just in time for Valentine’s Day, I’ve updated this popular chocolate bark recipe! Is there anything that goes together better than chocolate and red wine? Well . . . maybe chocolate and almonds and red wine. 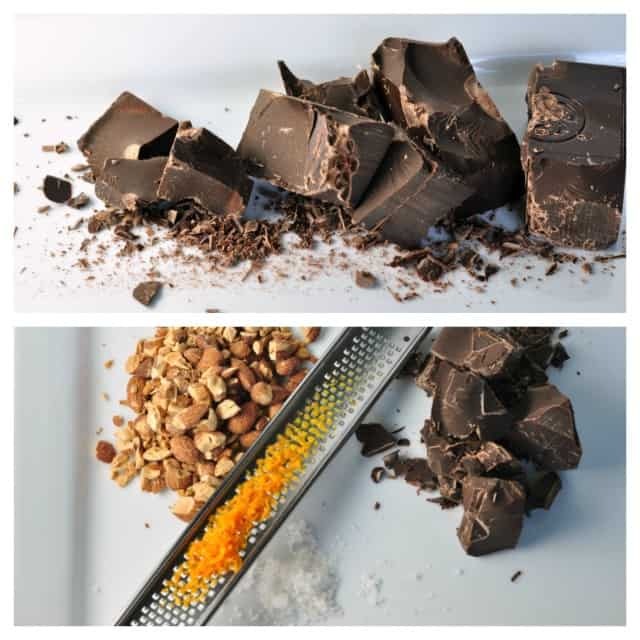 Or chocolate and almonds with orange zest and a sprinkle of sea salt! And that’s all you need for a perfect ending to a meal. As our family has reduced (or almost eliminated) sugar from our diet, I’ve discovered a simple truth: the less sugar I have, the less I crave. Filling our plates with a variety of veggies and high-quality protein reduces the desire to have something sweet and sugary for dessert. I do, however, love a piece of dark chocolate after dinner. 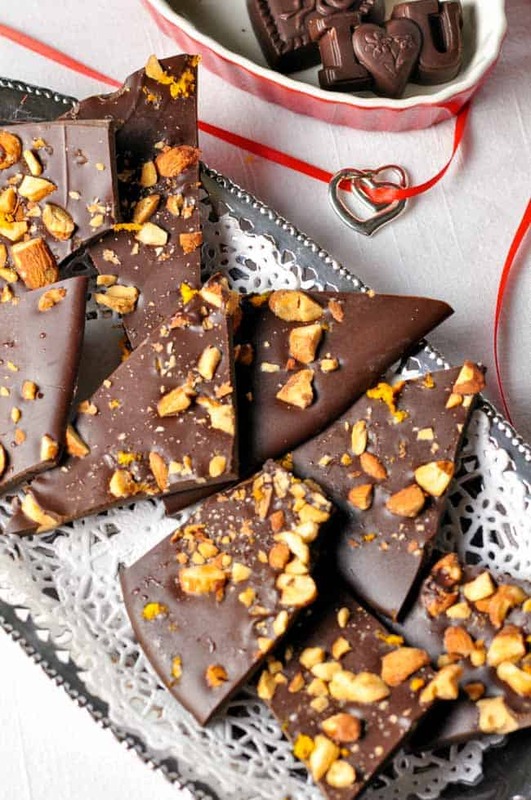 This Chocolate-Orange Almond Bark is something to look forward to throughout a meal. It can be made quickly before dinner, popped into the freezer, and will be ready in time for dessert. 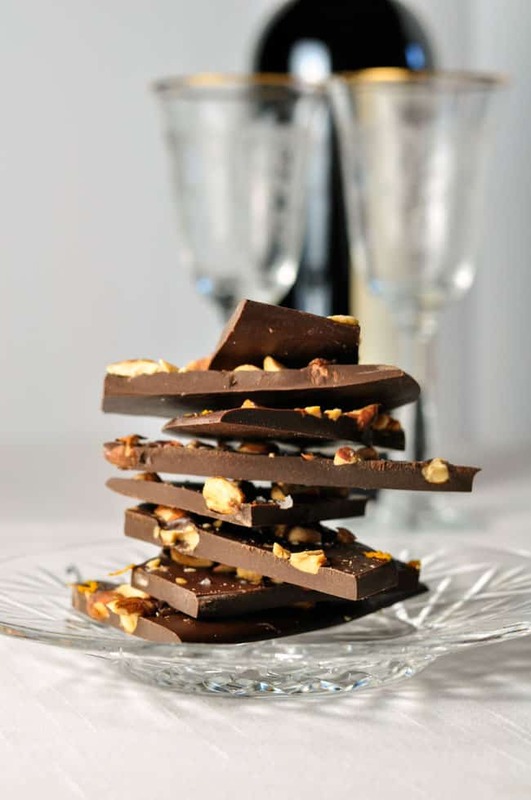 dark chocolate: use a high quality chocolate with at least 60% cocoa content, preferably 70 – 85%. almonds: blanched or unblanched. You will toast them to increase their flavour. Toast almonds for 7 – 10 minutes at 350°F on a rimmed baking sheet. Remove from oven, set aside to cool, then coarsely chop. Meanwhile, melt 3/4 of the chocolate in a bowl set over a pan of simmering water. Once it has melted, remove from the heat and stir in the remaining chocolate until melted. Spread the melted chocolate on the parchment paper-lined baking sheet, about 1/4 inch thick. While still warm, sprinkle evenly with orange zest, chopped toasted almonds and flaky sea salt. 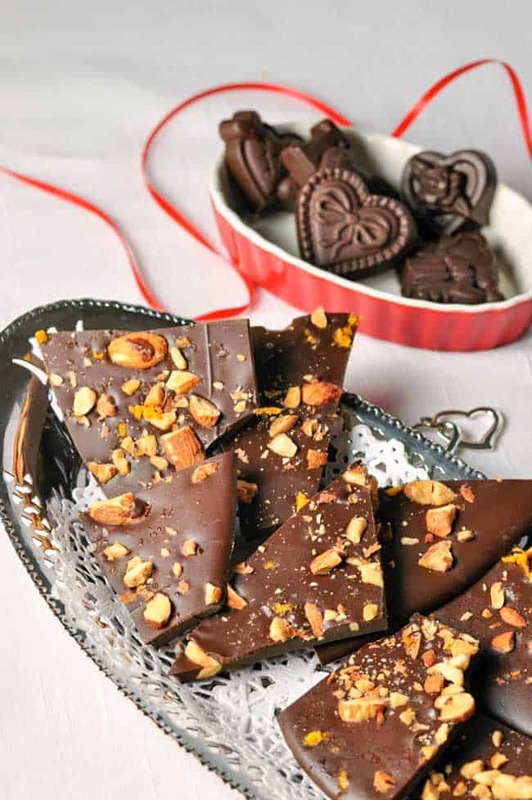 Adding a hint of orange to chocolate puts this chocolate bark over the top. I used zest from a Cara Cara orange, because I happened to have some of these specialty oranges left after making this Grapefruit-Orange Avocado Salad. They have a beautiful, almost floral, aroma, but any orange zest will do. 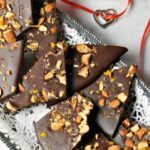 Sprinkling a little flaky sea salt over the chocolate adds another layer of flavour that makes this chocolate bark irresistible. 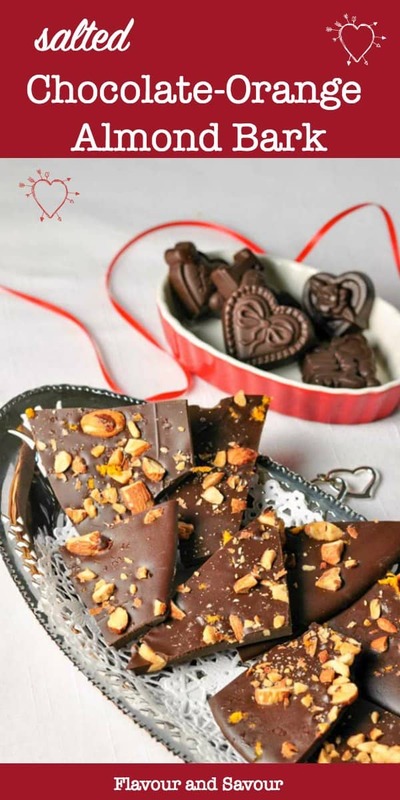 Whip up this quick and easy Chocolate-Orange Almond Bark before dinner, pop it in the freezer, and it will be ready for an after-dinner treat. Toast almonds for 7 - 10 minutes at 350°F on a rimmed baking sheet. Remove from oven, set aside to cool, then coarsely chop. Melt 3/4 of the chocolate over, not in, simmering water. Once melted, add the remaining 1/4 and stir until melted. Spread the melted chocolate over the parchment paper, about 1/4 inch thick. While still warm, sprinkle with toasted, chopped almonds, orange zest and sea salt. Chill in refrigerator or freezer until set. Love chocolate treats? Try these! Thanks Dawn! Happy weekend to you, too!